The theory of consumer choice assumes consumers wish to maximise their utility through the optimal combination of goods – given their limited budget. 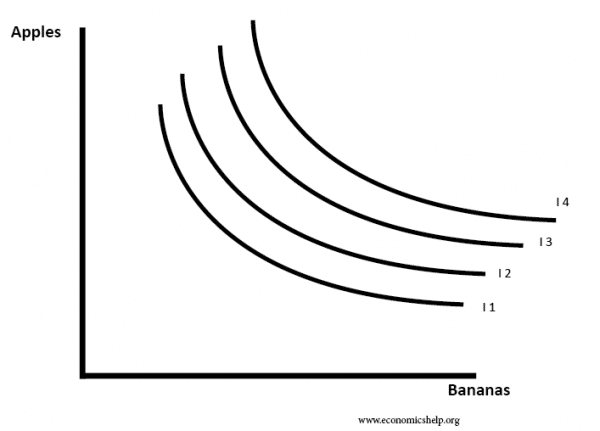 To illustrate how consumers choose between different combinations of goods we can use equi-marginal principle and indifference curves and budget lines. Consumer Equilibrium occurs when the marginal utility/price of each good is the same. This combination of good ensures, that they maximise their total utility. For example, if the price of petrol rises, the marginal utility/ price also falls. Therefore, to regain equilibrium, the consumer will reduce consumption of petrol, relative to other goods. This is known as the marginal utility of expenditure on each item of good. Suppose the price of good A and good B was £1. Then the optimum combination of goods would be the quantity of 4. Suppose the price of Good A is now £4 and the price of good B is £2. Measure utility. We assume consumers can measure the amount they enjoy a good by the concept of utility. Although it is difficult to precisely state how much enjoyment they get, we can make the best effort, with the concept of utils. If a consumer consumes more of a particular good, there usually comes a point where we get declining marginal utility. Extra consumption leads to a lower marginal utility. The marginal rate of substitution measures the slope of the indifference curve. The indifference curve measures the rate at which a consumer is willing to trade one good with another. If the rate of exchange equals the MRS, the consumer will stay put. 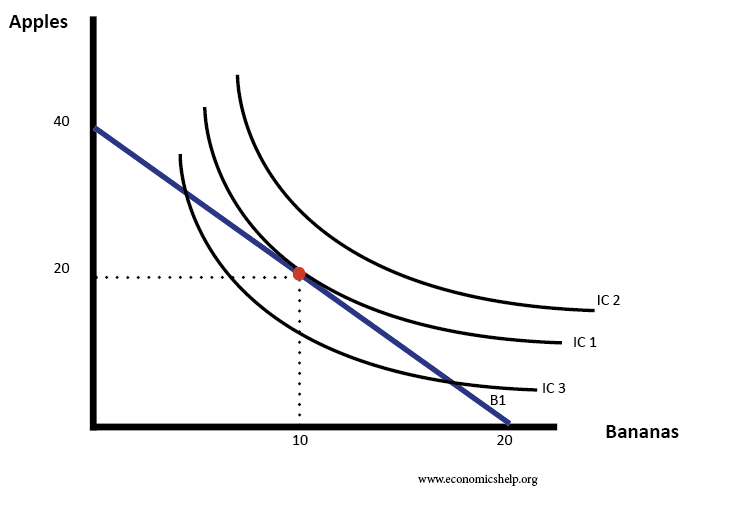 The slope of the indifference curve is convex because of the diminishing marginal rate of substitution. Neo-classical consumer choice theory has been criticised by behavioural economics which suggests reality is more complex. Heuristics – consumers do not evaluate decisions too closely – but make rough rules of thumbs. It is not worth spending time trying to evaluate the utility of behaviour. Consumer spending is often based on habits and influenced by advertising. Difficult to split up goods. Some goods like car / tv are only purchased infrequently and can not be mathematically split up.